This is the second year my fruit trees (plum, peach,) have produced bumper crops of fruit and shed every piece of it on the ground. By July there is not one piece of fruit on the tree. Can you help me figure out what is happening? Last year the apple tree produced no fruit. This year the tress are loaded, but dropping all fruit as well. frosts. Last year even blueberry production was compromised because of frost, and usually blueberries will pull through even when other fruits don’t. 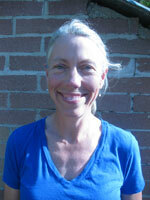 Fruit growers in WNC often hold their breath all spring in fear of an ill-placed frost. Spring weather in 2013 was very cool but many fruits escaped frost damage and it promises to be a good fruit year…sort of (the substantial rainfall in 2013 presents another set of problems like disease issues). Let’s go over a few reasons for fruit drop so you can determine how to proceed. Exposure to cold during bloom can result in fruit drop. Extremely cold weather over winter can even damage flower buds. Heavy fruit set usually follows a year with little fruit set. Why? It takes energy for the tree to produce fruit. Making fruit depletes the trees resources to a degree. If the tree produced no fruit the previous year it is full of energy to produce a nice crop the following year. Some fruit drop is natural. Apple trees drop some fruit for 2-3 weeks following petal fall. This is small fruit that oftentimes was not well pollinated. Why does the pollination factor matter? Put yourself inside the brain of a fruit tree. The fruit tree’s real mission is to set seed and reproduce itself. The fruit is just a delicious envelope that entices creatures to eat it and therefore distribute its seed. If the baby fruit contains few or small seeds, the tree drops it in favor of other fruits on the tree with better potential. Good pollination produces nice-sized fruits. Poorly pollinated fruit is often misshapen. Pollination can be affected by the cloudy, cold weather (bees tend to stay in their hives during grey weather) or by lack of pollinators in the landscape…a separate and alarming issue. Consider planting some pollinator-attracting flowers near your fruit trees to help ensure the presence of pollinators. To play it safe, plant trees that need each other for pollination no more than 50 – 100 feet apart. Apples have another predictable fruit drop in June called “June drop”. The tree naturally thins itself down to a more reasonable number of fruit. Hot, dry weather can aggravate increased fruit drop. You need to thin your fruit every year early in the season.What!? Yep. If you don’t do it, the tree absolutely will do it for you – sometimes just before your fruit is ripe. I know it hurts to pull those baby fruits off the tree, but you need to grit your teeth and do it. Again, the tree only has X amount of energy for fruit production. You can have lots of tiny fruits, or thin and get less fruit that is larger, better developed, and better for the tree’s vitality. Thinning also allows the tree to put energy into next year’s flower buds (next year’s fruit) and protects the branches from breaking due to fruit overload. To illustrate how important this is – I spoke to someone today whose young tree was loaded with peaches and very heavy from rain. The weight of the wet fruit actually broke the main trunk of the tree in half! Be patient. 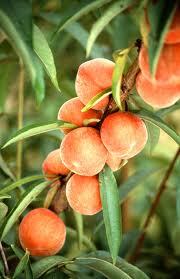 As your tree gets older, it will be able to accommodate larger fruit harvests, but you still want to thin every year. Pull ALL the flowers/fruit off for the first year or three – so the tree’s energy goes into establishing a good root system. Thin clusters of fruit to one fruit per cluster. Choose the largest fruit in the cluster if it is in good condition. Thin early, when fruit is about the size of a marble – within the first 4 weeks following bloom. Usually you need to thin a second time as the fruit grows. 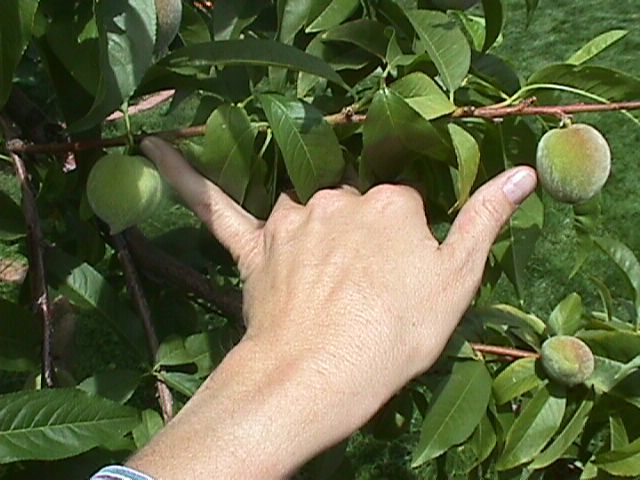 Thin plums to 3-4” apart, thin peaches to 8-10” apart, and apples to 6-10” inches apart on the branches. The full-grown fruit should not touch each other. Remember, two fruits that are touching make an ideal habit for insects and disease. Some trees may require up to 65 to 90% thinning, but it is better to start off with excellent fruit set and thin to what the tree can actually handle. 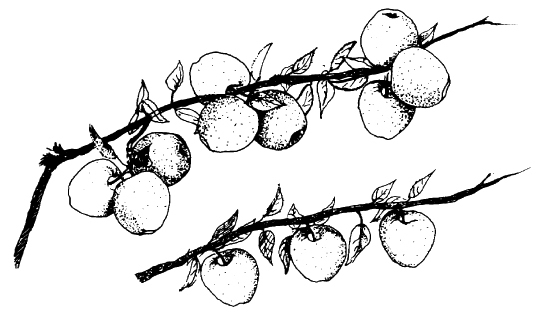 Remove fallen/thinned fruit from the property to prevent overwintering of insects and diseases like fire blight. The tree may not yet be of bearing age. The flowers or fruit may have been cold-damaged. If the tree had a large crop last year, it may not have sufficient energy to produce a fruit crop this year (annual thinning helps prevent this). Pollination may not have occurred or may have been very poor. This could be due to a shortage of pollinators (like bees), or lack of a pollinating partner (another tree). For instance, most apples require another apple that is a different cultivar for pollination. Pollen sterile apples require 2 other apples to get apples on all three trees. The tree may be getting too much nitrogen fertilizer (you could have fertilizer spillover from lawns or other crops). The tree may not be getting enough fertilizer. As Michael Phillips, author of “The Holistic Orchard”, puts it… keep your trees calm. You DO need to prune and fertilize, but you don’t want to go hog wild. Too much pruning and too much fertilizer can make your trees overly vigorous – with too much energy going into green growth and not enough energy going into flower and fruit production. The amount of fertilization and pruning should be just right. A soil test from NC State is recommended. Trees that are of bearing age should have about 12” to 18” of green growth every year. More than that may indicate over-fertilization or over-pruning. Less than that indicates that a little more fertilizer is needed. Thanks for writing Cheryl, and I hope this is helpful.